Southview of Lake Berkley in Kissimmee is a villa with 1 room. Situated in Kissimmee in the Florida region, Southview of Lake Berkley features a patio and lake views. Providing free WiFi, the property also has a tennis court and a fitness centre. This villa will provide guests with 5 bedrooms, a flat-screen TV and air conditioning. The villa also includes a kitchen with a dishwasher, and 3 bathrooms with a hot tub. At the villa guests are welcome to take advantage of a spa centre. A children's playground is available for guests at Southview of Lake Berkley ...to use. 192 Flea Market is 2.6 km from the accommodation. 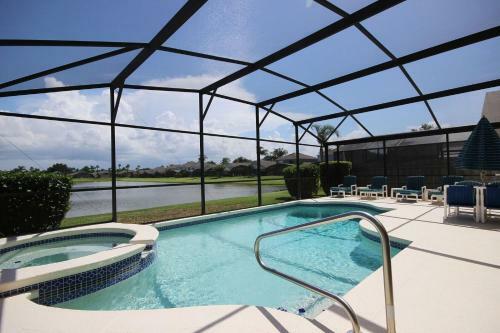 The nearest airport is Orlando International Airport, 33 km from the property. Situated in Kissimmee in the Florida region, Southview of Lake Berkley features a patio and lake views. Providing free WiFi, the property also has a t...ennis court and a fitness centre. This villa will provide guests with 5 bedrooms, a flat-screen TV and air conditioning. The villa also includes a kitchen with a dishwasher, and 3 bathrooms with a hot tub. At the villa guests are welcome to take advantage of a spa centre. A children's playground is available for guests at Southview of Lake Berkley to use. 192 Flea Market is 2.6 km from the accommodation. The nearest airport is Orlando International Airport, 33 km from the property. When would you like to stay at Southview of Lake Berkley?